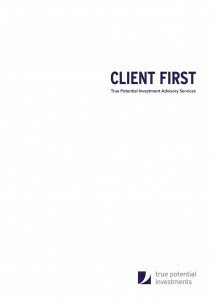 As an Investment Manager with True Potential Investments, you can offer a premium ‘Client First’ service to all, backed by our innovative investment solutions, exclusive technology and simple four-step advice process. If you have any questions about our ‘Client First’ offer or would like more details on the benefits for you and clients, contact us today on 0871 976 8888 or by email at recruitment@tpllp.com. True Potential Investments LLP is authorised and regulated by the Financial Conduct Authority. FSR No. 527444. www.fca.org.uk Registered in England and Wales as a Limited Liability Partnership No. OC356027.